"I need time to figure this out . . . time to invent something that will actually work in my classroom on Monday morning." Districts should spend approximately half of their professional development budgets on time for teacher invention. When teachers are encouraged to build technology-enhanced lessons and units, new technologies find a welcome mat awaiting their arrival and installation. They pass from "intruder" status to "partner" status. "When are you going to supply enough equipment so we can really make this program hum?" The creation of a vigorous teacher invention program is a rewarding path to technology acceptance and program integration. This professional development strategy may even engage some teachers who have seemed reluctant in the past. Teachers deserve a chance to convert theory into practice. As they invent, they can customize lessons to match their own students needs. They also end up feeling pride of ownership. The new unit is "their baby." They emerge from the invention workshop with a vested interest in seeing the results of their efforts. They want to be present in the delivery room. What is an Invention Workshop? Teachers gather together for a day or more. They meet with great resources and a clear purpose. Often they work in teams, but they may also split off to create their own individual lesson and unit plans. Some of the best invention workshops take place during summer months when staff can focus on the design process without worrying about lesson plans for substitutes or the press of classroom obligations. Working in teams offers the advantage of mixed skill levels and a good deal of informal learning. 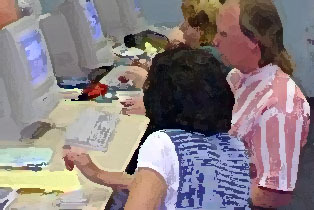 In the Grand Prairie ISD, for example, six or seven teachers combined with library media specialists from each grade level to build online Web-based research modules. These projects were designed to match existing curriculum topics while introducing students and other staff members to the power of electronic information. Within each team there were experts and novices. In addition, the district provided technology coaches and outside consulting support within the workshop setting so that each team might extend its resources when necessary. Throughout the first day, this mixture of skills led to intense informal learning as each team worked on its unit. The goal was creation of lesson plans to structure a student research investigation which might extend over 7-8 class periods and would require higher level thought. In order to develop such lessons, the inventors engaged in a number of tasks that were new to many of the team members. One task was prospecting - the search for appropriate electronic information resources to support the student research projects. Because some of the participants had never used search engines or search strategies, their partners quickly introduced them to such skills in the course of prospecting for the unit. One group set off in search of Web sites devoted to Texas heroes. Another went looking for information on Native American tribes from the Texas plains. Instead of learning these important information skills in isolation, team members acquired them naturally in service to the invention process. The day was rich with "just in time learning." An invention workshop usually extends over more than one day, depending upon the complexity and scope of the project. Activities should be structured so that this time is spent fruitfully, and the invention process is guided by standards to ensure quality. The invention process requires teachers to analyze learning experiences in great depth, breaking them down into components and noting how they relate to each other before re-assembling them into a new version appropriate for their own classrooms. Creating lesson plans requires a level of understanding vastly different from that required during most staff development lessons which show teachers effective practices. When faced with the challenge of making something work with real children in a real classroom, the teacher asks nuts and bolts questions. Theory is grand, but classroom realities require a very practical look to determine which strategies will work with Sally or Dan and Natasha. The best way to fashion effective lesson plans is to try the activities, role playing student tasks and adjusting the elements of the plans until all flows smoothly and well. Unlike packaged programs and imported programs, inventions are developed with particular classrooms in mind. They are customized to match the needs, interests and abilities of those who will enjoy them. Teachers who construct their own units end up caring about their success. These plans, strategies and tools become part of their teaching repertoires. Once they take the time to figure out the puzzle, they feel proud of their accomplishment, and along with pride comes the desire to share. These lessons are unlikely to sit on any shelves because there has been too great an investment of energy and self for them to languish unused. Familiarity breeds . . . comfort and calm. Having lived with the nuts and bolts of the unit during its birth process, the inventors know every detail like the back of their own hands. Unlike so many packaged technology programs brought into schools, homemade programs can still fears and quiet anxieties. What elements are required to achieve success? The invention process is no slam-dunk. There are risks to setting the process in motion. Chief among the dangers is the tendency of some districts to provide little in the way of expectations that might serve to inspire quality. The clearer the structure provided for the inventors, the greater the likelihood that products will be worth the investment of district funds and professional development time. Structures guide toward quality without restricting or limiting creativity and originality. It helps enormously if teachers can see examples of what other teachers have created and step through an online learning experience, which highlights the key features, and elements of what it is they are expected to build together. This set of Web pages was used to introduce teachers in the Grand Prairie ISD to the concept of research modules. It clarified expectations and provided the scaffolding they needed to know how to proceed. Enjoy the many offerings of successful research projects as well as online resources that show teachers how to build units. Quality also emerges when the criteria for success are explicitly stated and then emphasized at the beginning of the invention process. Too many project leaders will skip over this step to their later regret, as mediocre products can easily result. There is always some danger that tradition may undermine good results. A long history of topical research projects, for example, can lead to the development of units which are little more than 1950s assignments dressed up in electronic threads. that makes the characteristics of a strong unit plan quite evident. As a team moves through the planning and development stages, a lead teacher or supervisor with strong program skills should hold periodic conferences with the team at key points to help them stay on track and maintain quality. Especially for those who may be working for 3-5 days, it is foolish to allow several days to pass without providing feedback and support. Checkpoints help ensure that forward movement is productive and appropriate. In addition to providing adequate time, the next most important resource for teachers is knowledge. In order to protect a team from re-inventing a (stone) wheel, consultants can inform the group of best practices and research findings from around the world. These may be internal or external consultants but providing broadened perspective is their prime purpose. A high level of quality must be reached before a unit is released for publication and classroom use. A leader or a committee with good skills, knowledge, tact and authority should work with each team to make sure they understand what is required before the work is approved for implementation. This is not an easy task because it may cause hard feelings to suggest that a group has more work to do. Invention is the parent of integration!